For many players, basketball season doesn’t end once the final buzzer sounds in the WNBA. 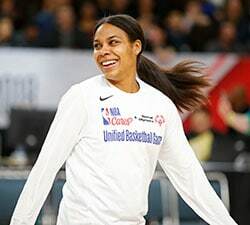 Here are some of the top recent performers during international play — click here to see the full list of WNBA players overseas. 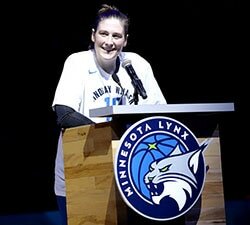 Fowles earned both league and Finals MVP honors in helping carry the Lynx to a title in 2017. So it shouldn’t be a surprise to anyone to see that she is playing exceptionally well for her professional club, Beijing, in the Chinese Women’s Basketball Association. On the season, she is averaging 20.7 points per game and 16.0 rebounds per game. In Beijing’s most recent game, an 87-71 win, Fowles dominated the floor, scoring 32 points and adding 11 rebounds. Griner has continued her solid play overseas this WNBA offseason. The 6-foot-9 powerhouse is leading the Russian Professional Basketball league in scoring (20.4 points per game), and has averaged 16.0 points and 8.0 rebounds in her teams last two games. She was on our first list of stars excelling overseas a few weeks back, and she has maintained dominance since we last checked up on her. Griner undoubtedly has the chance to once again be one of the best players next WNBA season, and it is no surprise to see her dominating like she is in right now in Russia. The former Michigan State Spartan has impressed during her time with the Dallas Wings, despite an injury-plagued 2017. In 12 appearances this pas season, she scored in double figures six times. Her career high of 23 points came against the Sparks on July 30th. 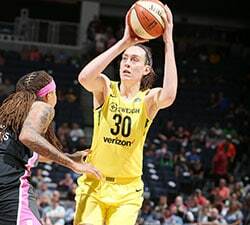 Currently, the Dallas guard is overseas playing with Turkish professional team Fenerbahce, and in her most recent appearance she filled up the stat sheet with 21 points, six assists and five rebounds. Powers will continue to get more and more playing time if she keeps her play consistent with her last line. Like Fowles, the center for the Atlanta Dream is playing in the Chinese Women’s Basketball Association, but is suiting up for Liaoning. She is leading her team in points (19.0) and rebounds (8.8), and has been consistent for them all season long. In her team’s two most recent games, Williams has stayed true to form, averaging 19.0 points per game. The former Duke Blue Devil cracked the top-10 in rebounding in the WNBA last season, so expect to see her confidence continue to rise each time she steps foot on the court. Wheeler is coming off of her best season as a pro, with career highs in points (11.8) and assists (4.1). Currently, the guard out of Rutgers is overseas playing in the Turkish professional league for Besiktas, and she has carried over that solid play. In her team’s last two games, she is averaging 18.0 points and 8.0 assists. The Indiana Fever product continues to gain confidence in her game, and she is showing it right now for her team in Turkey.